Martin was born in Coomera in 1895, the son of John Sheils, an irish immigrant and Margaret (nee Smith) a daughter of a Coomera pioneer. They took up a selection of land at Upper Tallebudgera and moved there in 1905. They established a dairy, grew bananas and had 5 daughters, 3 sons and also looked after a cousin. 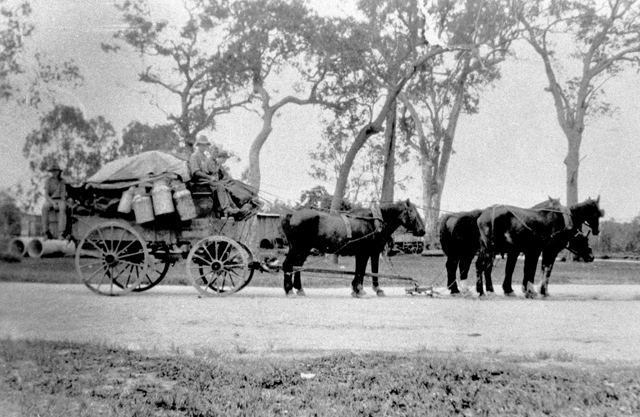 Martin established a track from Upper Tallebudgera to Springbrook so cans of cream from Percy Reid could come down with Martin's Uncle-in-law, Bill Smith (a carrier) from the mountain rather than the long way through to Mudgeeraba. One day while out turkey shooting, to help feed the large family; Martin found his way up onto Springbrook, previously thought impossible. As a result of this a track was cut from Springbrook to Tallebudgera. The cream from Springbrook was then brought down the mountain rather than the long winding road to Mudgeeraba. It also brought much pleasure to the families of Tallebudgera and Springbrook as they could travel up and down the mountain on horseback to the dances. Dances in aid of the ambulance were held in a big shed at the Sheils home, with the family supplying the music. Mass was also held there with the priest coming up from Coolangatta on horseback. The Cream Track is the name given to a lush rainforest five kilometer track which generally follows Road Reserve from Springbrook Mountain to Tallebudgera Valley, including some significant sections of jungle and multiple forest types on Serenity Farm private property and National Park. This website was created by the owner's of Serenity - a 100 year old farm and Highland Cattle Stud located on 200 acres at 2940 - 3000 Springbrook Road, bordering the Road Reserve and National Park on the Springbrook Plateau. In order to avoid prosecution for trespass on this property, better secure your safety from the dangers of farm machinery and livestock on this working farm and ensure the bio-security of the region, an online permit, disclaimer and bio-security agreement has been created. The Cream Track Serenity Farm Permit provides legal permission for you to walk upon sections of the cream track which are contained on that private land forming part of The Cream Track experience. Issuance of the permit is contingent upon your agreement to strictly adhere to the pathogen control protocols detailed below which include proper use of the Pathogen Control Stations provided at both the Tallebudgera Valley and Springbrook Mountain entrances to the track - thus assisting in ensuring the bio-security of our delicate environment. Originally little more than a single track sufficient to support the journey of a pack horse laden with cream transported from the Mountain to Mudgeeraba over 100 years ago, the old original track was later used by cedar getters in the 1920-30s and again during World War Two by both Australian Infantry & the American 5th Platoon 2nd Reporting Company 565th AW Bn to allow passage to military jeeps, soldiers and other equipment stationed on the farm for observation and strategic purposes (see slide show below for military archive photos of the American Early Warning Radar installation atop Serenity). In 1942 Roger Crawford Van Keuren (1915-1983) was a sergeant in the U.S. Army Air Corp as a radar operator stationed on Springbrook Mountain. He reported radar contact with two Japanese submarines but the message was rejected by the Australian navy due to the newness and unreliability of radar at that time. The story of the subsequent attacks by subs at Sydney and Newcastle continues here. Sgt Van Keuren married an Australian girl - Elfrieda (Elfie) Gertrude Agnes Mackenzie (pictured above) - on April 1, 1943 in Southport, Queensland, Australia and honeymooned at Burleigh Heads. Their son Felix Roger Van Keuren was born on March 24, 1944 in Southport, Queensland. The family moved to America after the war with strong links to Australia continuing to present day through their American daughter Gilda. In the 1980s, National Parks and the Rural Fire Authority conducted significant maintenance works upon Springbrook Mountain sections of the track using a D6 bulldozer to ensure continuing access during times of emergency, thus contributing greatly to the track's current form. Tallebudgera sections of the track are generally well formed providing access to the Gold Coast's most historically significant Banana plantations - visible en route - some of which are operated to this day by Mr Harley Smith - local bush walking legend and author of East of Springbrook . NB Please remain well outside these working plantations at all times to ensure the bio-security of this region in addition to the safety and privacy of landholders. 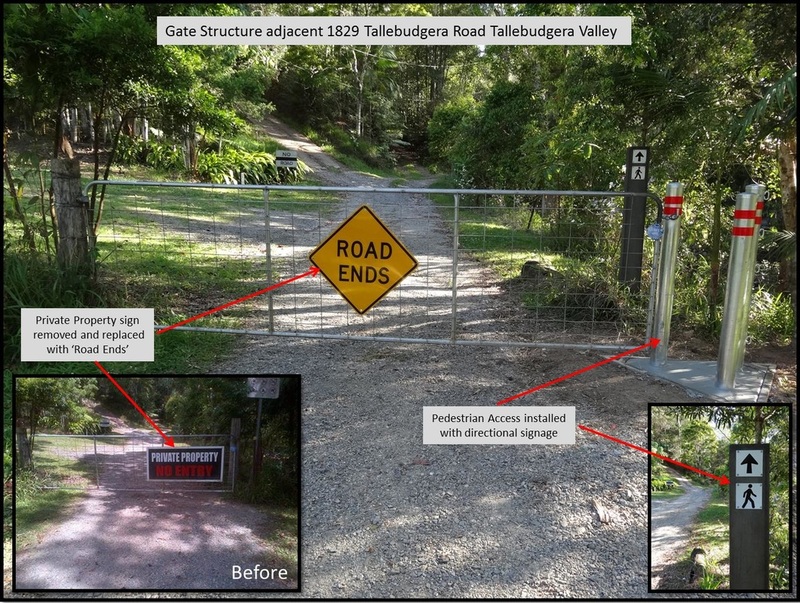 Thanks to the wonderful support and vision of Gold Coast Mayor Tom Tate, public access at the Tallebudgera Valley entrance to the track has been ratified and much improved with the provision of better signage, installation of pedestrian access bollards and the installation of a brand new Pathogen Control Station. Access for prams, bicycles and disabled persons can be obtained via the permanently unlocked gate adjacent to the bollards. NB Gold Coast City Council commenced proper survey of the cream track in late 2015. Until necessary survey and track realignment work is completed, please use the GPX files and other Geospatial resources available on this website to ensure you remain on Gold Coast City Council controlled road reserve at all times throughout the Tallebudgera Valley sections of the track. 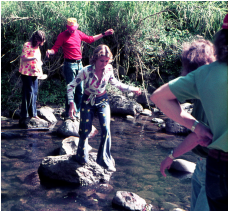 Walking the Cream Track through the years... in addition to the many practical uses made of the cream track over the years, recreational bushwalkers from around the world have continued to enjoy the track for close to 100 years. Historical information, photos and stories can be contributed to this site via the upload links (below). The owners of Serenity are proud to celebrate the cultural and natural heritage of this track by maintaining access for emergency services, National Parks personnel and keen bush walkers from around the world who regularly use the track to explore the World Heritage listed Springbrook National Park and environs. 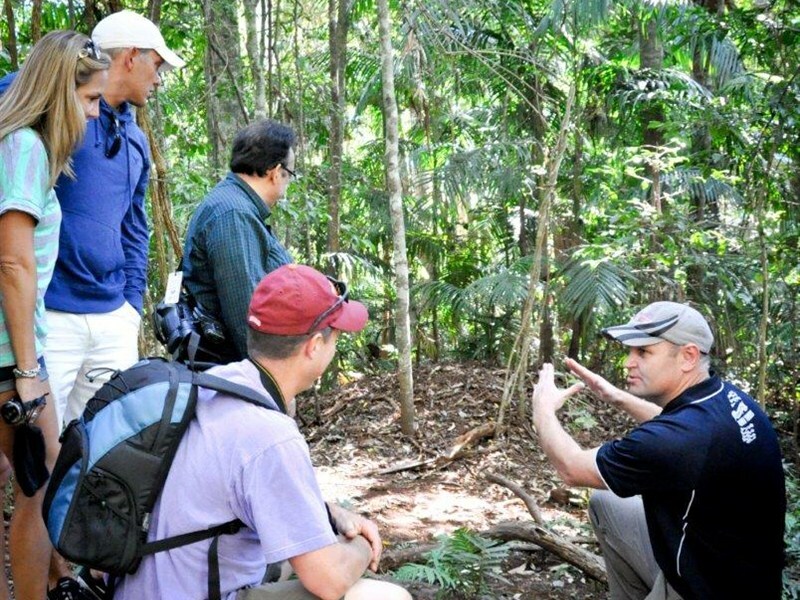 In September 2015 Gold Coast Mayor Tom Tate joined Cr Chris Robbins, Cr Greg Betts and Tim from GCCC Natural Areas Management Unit in walking The Cream Track all the way from Springbrook to Tallebudgera Valley. Exploring a potential extension to the Great Walks effectively linking the mountains to the beach, find out more about the Mayor's visit here. Remember that trespass applies to all walkers on the Serenity Farm sections of the track who enter without a valid permit and that walkers wishing to remain on the Road Reserve without entering the property must stay on the Northern side of the established fences line at all times to avoid prosecution. Your assistance in completing the online indemnity form and bio-security agreement will provide immediate issuance of your Serenity Farm walking permit, ensuring the continued support of the property owners and trouble free access to the Serenity track on the day of your walk. 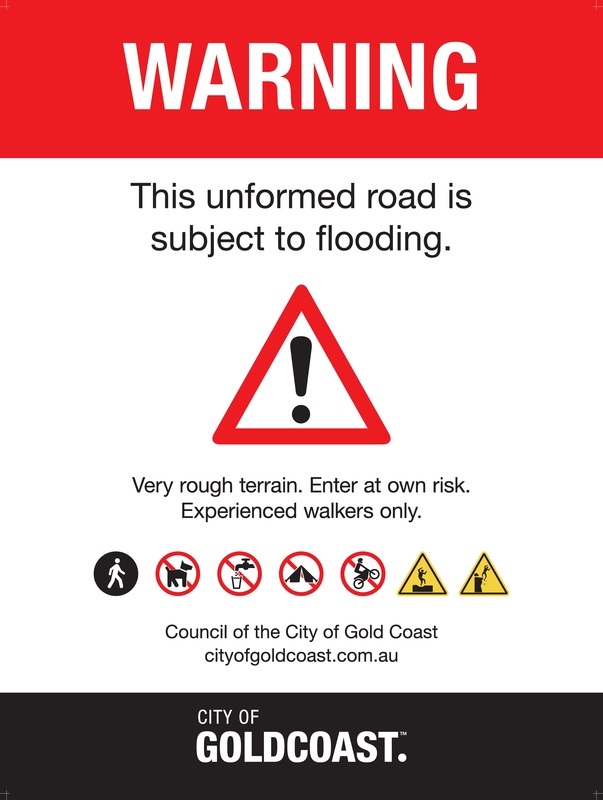 Subsequent to recent interference and removal of track markers placed by Surveyors in August 2015, it is highly recommended that walkers utilize the GPS resources provided (below) en-route to ensure they remain on the Gold Coast City Council controlled Road Reserve portions of the track throughout the Tallebudgera Valley sections and/or consider accompanying either an experienced cream track walker or bush walking club that is equipped to guide your walk (see links below). As the descent is significantly easier and more intuitive, it is also the advised method of initial transit in getting to know this wonderful five kilometer walk. Walkers considering an ascent from the end of Tallebudgera Creek Road to Springbrook Mountain are advised to download the following excellent resource created by Peri Frangos in association with Friends of Currumbin and the Mid Week Walking Group. The document provides photos and notes which will assist in ensuring you remain safe and on track throughout your journey. Many thanks for this wonderful resource Peri... (update: subsequent to creation of this track report, GCCC survey based track markers now indicate correct route including essential Banana Plantation private property bypass). Use this Garmin file in your hand held GPS - ( load the file using Garmin BaseCamp ) to follow a track that remains on State Government Road Reserve and does not enter private property in Tallebudgera Valley. NB This GPS track avoids all incursions identified by the 02Aug15 survey team (Schlenker Surveying). NB We highly recommend that you download the Google Earth compatible Surveyed Track KML and Cadastral Property Boundary KML files (below) to familiarise yourself with the route, assisting in ensuring that you do not venture from the Road Reserve and inadvertently trespass on private property at the Tallebudgera Valley end of The Cream Track. These can be easily dragged into Google Earth for printing or exported into your Garmin hand held GPS for use en route using the GPSBabel file converter or equivalent. 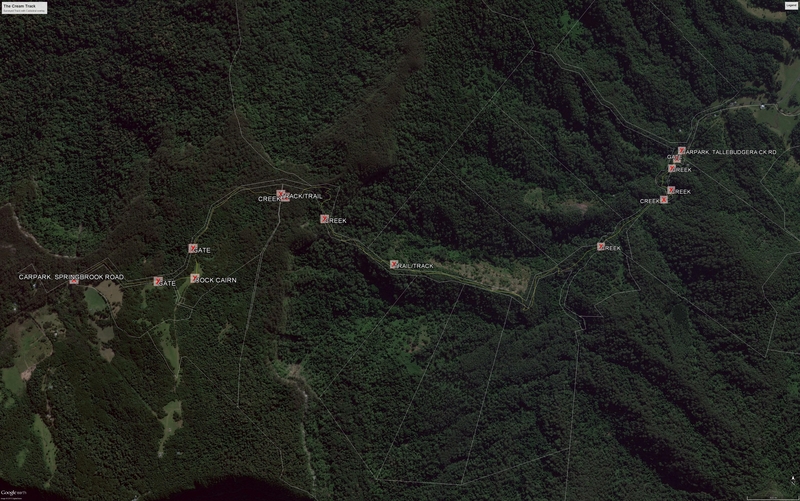 NB There are three small sections of the track in Tallebudgera Valley identified as impinging slightly upon private property as determined by a Survey conducted on 2nd August 2015. These are indicated below (encircled) and refer directly to the KML and cadastral files above (generated by the survey team 02Aug15). To avoid trespass, please familiarise yourself with these potential incursion points and use the Garmin GDB file (above) to ensure that you remain on State Government Road Reserve at all times. 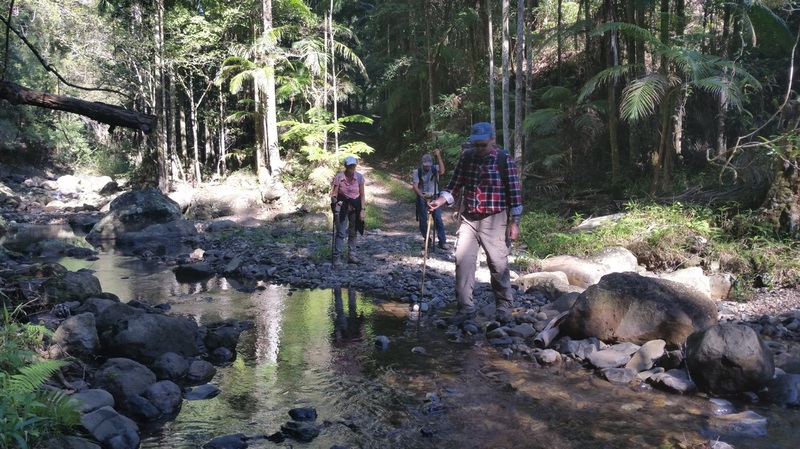 The walking permit issued from this website strictly applies to the Serenity Farm portions of the track only - leading from the end Springbrook Rd to the National Park corridor on the farm's Eastern Boundary. There are a number of registered Survey Plans available for download at the bottom of this page for those interested in identifying historical survey markers along the way. BTW The road and gate at the end of Tallebudgera Creek Road are on Road Reserve and you are not trespassing by entering therein, but please be aware of the three potential incursion zones (circled) beyond. Upload a photo or story about The Cream Track to add to our page. 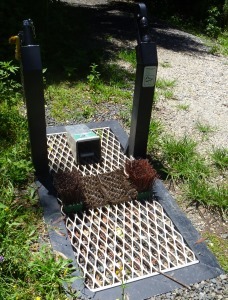 Serenity Farm and the Gold Coast City Council have installed Pathogen Control Stations manufactured by the Australian company that provided units to Queensland National Parks for the Great Walks program. The Gold Coast City Council unit is installed at the Tallebudgera Valley entrance to the track and the Serenity Farm station is located just inside the farm gate at the Springbrook Mountain track head. These pathogen control facilities are equivalent to those already in use on Springbrook Mountain, Green Mountain, Binna Burra and throughout other sensitive ecosystems... proper use of this infrastructure is vital to the protection of our local ecology. Proper use of the Pathogen Control Stations will help protect our wonderful environment for all to share into the future. Stop the spread of pathogens (disease producing organisms such as phytophthora (PDF)*, myrtle rust and amphibian chytrid fungus). Soil and detritus can contain pathogens such as fungal spores that are harmful to the forest and frogs. Start and finish you bushwalk with clean footwear and camping gear by removing soil from footwear, camping spade or trowel and tent pegs before leaving an area and keep all gear as clean and free from soil as possible during the walk. Please clean and disinfect your footwear and camping equipment using a disinfectant either at home or before visiting the track. Use pathogen control stations located at track entrances to the track if available. In 2011, Gold Coast City Council responded to an application to close a section of the Road Reserve upon which the cream track transits. GCCC noted that "this portion of Tallebudgera Creek Road, Tallebudgera Valley provides for a connection to the world heritage listed Springbrook National Park. It would not be in the long-term interest of both the immediate and wider community to permit this permanent road closure and remove an access point to the Springbrook National Park, which provides for public recreation and valuable tourism opportunities for the Gold Coast economy" (full document available for download below). Celebrate the vision for sustainable eco-tourism with a low-carbon footprint walking journey via the cream track heritage trail. Registered Survey Plans and documents available for download below for those interested in identifying historical survey markers en route and studying the survey history of the track.